Tim Tebow is one of my favorite athletes of all time. The man is the personification of class, and always brings out the best in others. Now he found someone who brings out the best in him. 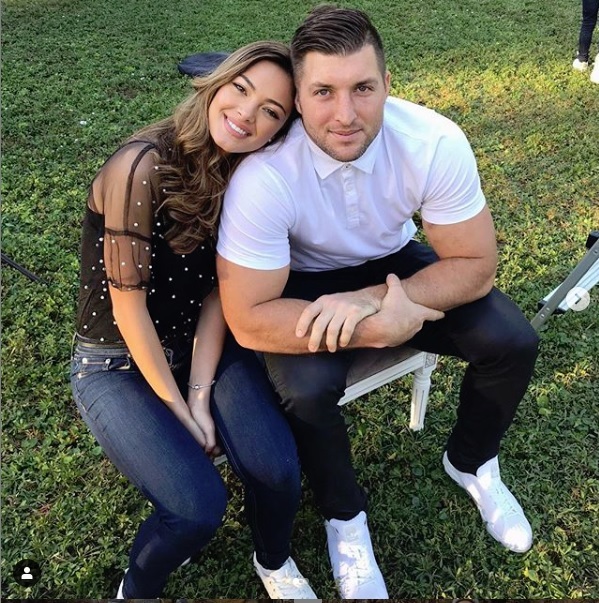 Tim Tebow has gone and made his relationship with the former 2017 Miss Universe, Demi-Leigh Nel Peters, official after he proposed to her. “Thank you for saying YES and making me the happiest man in the world. You’re the love of my life, and I can’t wait to spend the rest of my life with you,” the 31-year-old former National Football League player captioned his post Thursday on Instagram, along with a couple of shots of the big moment showing him down on one knee to pop the question. Soon after, the 23-year-old former Miss South Africa announced the news to her followers with a post on her social media account. Congratulations to you both. Feel free to browse Demi-Leigh’s Instagram page. She’s crazy stupid hot. Posted on January 11, 2019 January 10, 2019 by WyattPosted in CoolnessTagged Demi-Leigh Nel Peters, Miss Universe, Proposal, Tim Tebow. Next Next post: Licker? I Hardly Know Her! It made me smile to see this on the news last night. Congrats to him and his lady! Ronni – Agreed. Nice man needs a a nice girl.